Dog Osteosarcoma and Arthritis Cured? This is the story of Brutus who had dog osteosarcoma and arthritis. His owner used learned how salt cures dog bone cancer. First, check out this video about Bob Butts who first tried it on his own dog. View time 2 min, 14 seconds. Brutus, was given just 2 months to live. He was diagnosed with arthritis and osteosarcoma. 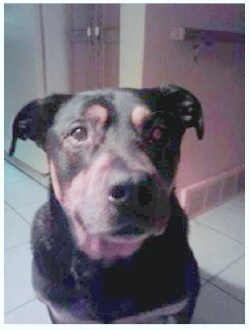 A Rottweiler, Pit-bull mix, he is 12 years old and weighs 103 lbs. On his right forelimb, there was a tumor that continued to grow in size no matter what was done. It had spread to his elbow where there already was arthritis. It was expected that the dog arthritis pain would become so excruciating that putting him down was the only option the vet gave. Following the veterinarians advice, Brutus was put on Rimadyl and Tramadol. Unfortunately, this resulted in urinary incontinence. The only other prescription we could use was a NSAID called Metacam. Then a friend suggested putting Brutus on a holistic treatment. There was noticeable shrinkage of the tumor on his leg but the incontinence continued. On researching everything there was on the topic, Shirley, the caretaker of Brutus ended up even more frustrated. There were contradictions and potential complications no matter what choice was available. At the time the water cures protocol was implemented, Brutus was on Tramadol and Zeel (an arthritis remedy). The natural treatments being given included MSM, enzymes, glucosamine, milk thistle, chondroitin, astragalus, reishi mushrooms, apricot seeds, and a probiotic. These are known to help with inflammation, pain, liver health, kidney support, arthritis and are considered anti cancer supplements. Then on July 13, 2013 the water cures pet protocol was tried. At this time, Brutus was experiencing so much pain, he did not even put his paw to the ground. By July 16, the tumor in his arm had shrunk to less than half the original size and Brutus appeared to feel much better. He was given 1/4 teaspoon of pink Himalayan salt in his drinking water and the same amount again in the morning. By the afternoon, he never limped again. Three months later, Shirley responded with an update. Brutus, still alive and well is going for walks and enjoying life. Since then, his diet has remained very pure and he was taken off pain killers and supplement. Epilogue: Brutus was given a beef jerky treat that originated from China. Hundreds of pets died in the US as a result of eating these treats. Brutus was one. Even so, Shirley is still excited that the water cures ended his osteosarcoma and arthritis. Water Cure Pet Protocol for Dog Osteosarcoma and Arthritis.